We’re just about at the mid-point of summer, which means there’s still a lot of summer left to be had, but I feel like it’s a freight train barreling out of control. It’s the middle of July, and it feels like just yesterday we signed the closing papers on our house (which happened the week before Memorial Day). I guess time flies when you’re having fun! I definitely feel like summer is slipping through my fingertips, so I’ve been trying to eat up as much of it as I can. The blueberries lately have looked especially amazing. They are all so big and plump, and taste just as good as they look. I picked up a huge container at Costco on Friday and didn’t last more than 24 hours before I was in the kitchen with them. I’ve been wanting to make a blueberry buckle for years, and finally got down to it. 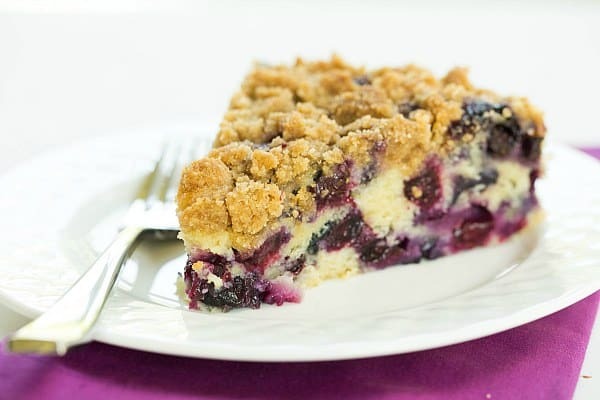 In case you haven’t heard of blueberry buckle, it’s basically a single-layer blueberry coffee cake with a streusel topping. 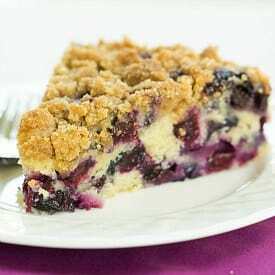 I don’t know about you, but I live and die for streusel topping. 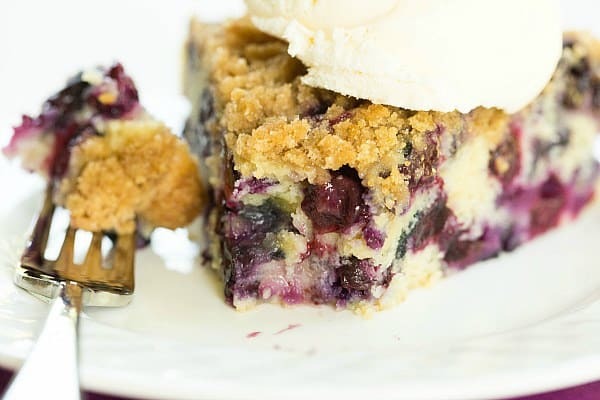 As it turns out, there are recipes for blueberry buckle everywhere. I sifted through a lot of them before deciding on which one to try. The deciding factor? This recipe has a whopping 4 cups of fresh blueberries, which was by and far the most of any recipe I found. More blueberries could only mean more deliciousness, I decided. Plus, the streusel topping looked substantial, more like a crumb topping, which rocks my world. I couldn’t have been more excited about how this recipe turned out. There is just enough cake batter to hold the blueberries together, which means it’s basically like just eating fruit, which means you could totally have this for breakfast (don’t you love my logic?). 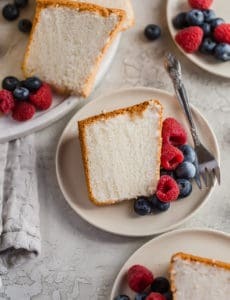 It’s a perfect breakfast/brunch cake, as well as a great dessert for any time of day. I’m riding the blueberry train as long as I can; if you’re hopping on, too, you definitely want to make this cake before summer’s end. 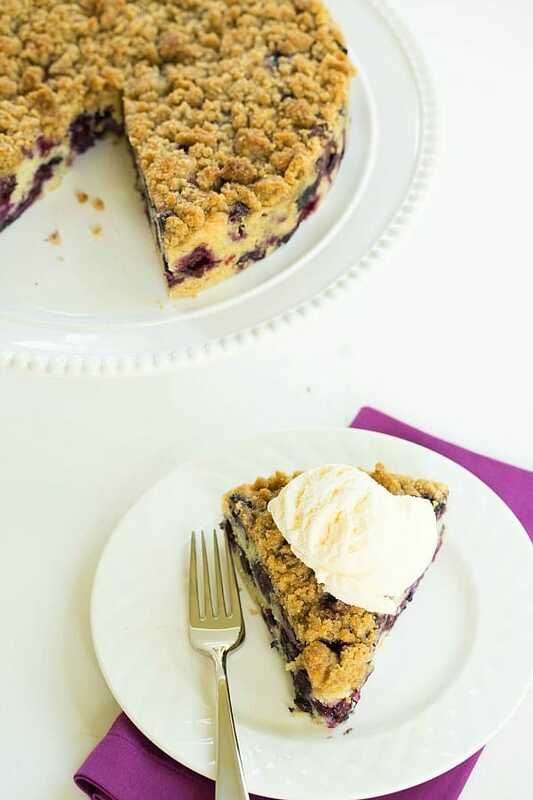 A fabulous recipe for Blueberry Buckle; it's bursting with fresh blueberries and topped with a crumb streusel. Make the Topping: With an electric mixer, combine the flour, sugars, cinnamon, and salt on low speed until well combined, about 45 seconds. Add the butter and continue to mix on low speed until the mixture resembles wet sand and no large butter pieces remain, about 2½ minutes. Transfer to a small bowl and set aside. 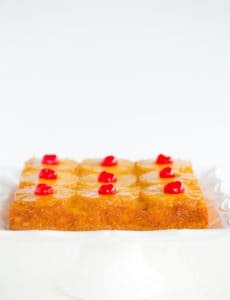 Make the Cake: Adjust oven rack to lower-middle position and preheat oven to 350 degrees F. Grease a round 9-inch cake pan, line the bottom of the pan with parchment, grease the parchment, then flour the inside of the pan. In a small bowl, whisk together the flour and baking powder; set aside. Using an electric mixer, cream together the butter, sugar, salt and lemon zest at medium-high speed until light and fluffy, about 3 minutes, scraping down the sides of the bowl as needed. Add the vanilla and beat until combined, about 30 seconds. Reduce the mixer speed to medium, then add eggs one at a time; beat for 5 to 10 seconds, then scrape down bowl and continue to beat until fully incorporated (mixture will appear broken). Reduce the mixer speed to low, then gradually add the flour mixture and beat until the flour is almost fully incorporated, about 20 seconds. Use a rubber spatula to finish mixing until no flour pockets remain (the batter will be very heavy and thick). Using the rubber spatula, gently fold blueberries into the batter until evenly distributed. Transfer batter to prepared pan; use an offset spatula to gently spread the batter evenly to the pan edges and smooth the surface. 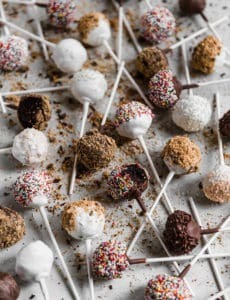 Squeeze a handful of the streusel in your hand to form a large cohesive clump; break up the clump with your fingers and sprinkle evenly over batter. Repeat with remaining streusel. 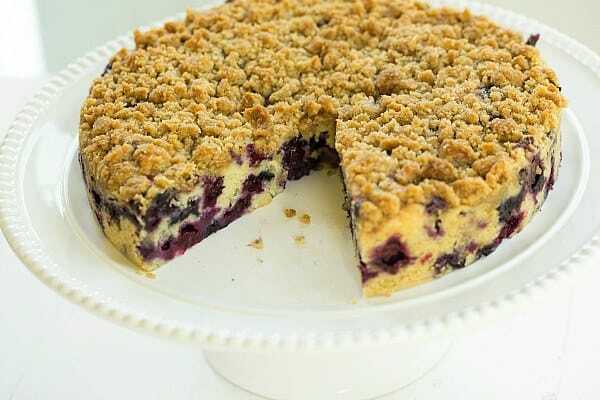 This is by far one of the best blueberry coffee cakes I’ve had yet. I used 2 pints of berries (all I had) and cooked for 45 minutes and it turned out amazing. And because there are soooooooooo many berries in it I feel like I’m eating fruit instead of cake. Definitely a keeper. This was a disappointment after spending a lot more on ingredients than I could have bought store bought….55 min. was too long to bake it, came out with a dry cake. Mouth feel was not good either. Don’t know what I did or if it was the recipe. Basically I’m going to stick with my cook book recipes, I have had this happen with other on line recipes. Too much to risk, time and materials, back to my Better Crocker cook book. Not good, either butter or flour is off. Way too much butter. Hello. Would this buckle turn out if I added 2 cups fresh raspberries and 2 cups blueberries? Hi Trish, I think that would work just fine! Hi Jean, I haven’t tried to use frozen so I’m not sure how it would be affected, but if you try it out, let me know! So there is no milk in this recipe? Hi Denise, Correct, there is no milk in the recipe.